How to Download/Install/Uninstall Apps on Samsung Galaxy S8/7/6? Home > Resources > Manage Samsung > How to Download/Install/Uninstall Apps on Samsung Galaxy S8/7/6? On your Samsung Galaxy mobile phone, you can download various apps to the device from Google Play and install or uninstall apps on the device directly. However, if you come across some fantastic apps from your computer and want to import them to your Samsung phone, or you just find some apps that are not available from Google Play, what will you do? Have you ever thought to download, install and uninstall apps with one click? Is it possible? All the answers can be found in the following article. Just read on to learn more. To make the apps installing and uninstalling tasks easy for Android users, Coolmuster studio introduces the Android Assistant, the best Samsung Apps Installer program to help Samsung and other Android devices users to install, uninstall and share apps on Samsung Galaxy S8/7/6/5 directly and effortlessly on computer. 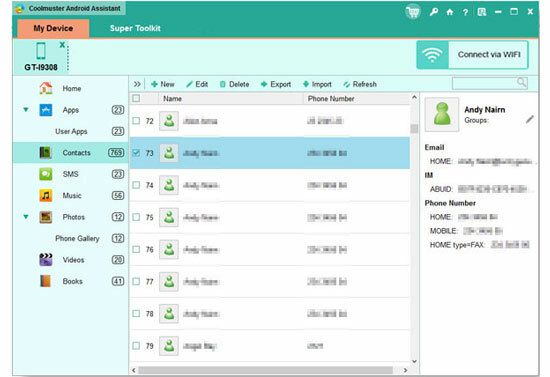 This program can also enable you to transfer files between Android and computer, manage contacts, photos, videos, music, SMS & more on computer, and even send text messages from computer to any phone number. Now, you can download the free trial version of the Samsung Apps Installer from the buttons below. The operations on Windows and Mac platforms are almost the same. Please note it supports almost all Android devices, including Samsung, HTC, Sony, Motorola, LG and so forth. At first, link your Samsung Galaxy S8 to computer via USB and launch this Android Assistant on PC. Then you will get an interface as following picture, with your S8 detected and displayed on the program main interface. Choose the "App" icon from the top menu and all the applications installed on your Samsung Galaxy S8 will be displayed. Then, you can go to the tool bar, selectively to install, uninstall, export apps freely accordingly by clicking on the "Install", "Uninstall" or "Export" button. Of course you can install and uninstall Android apps on your Android devices directly, but Coolmuster Android Assistant can make things easier. All tasks can be accomplished within one mouse click. Just download to explore it by yourself.